Agent Survey – NaNo Style! Do you see an uptick in year-end queries because of people’s participation in NaNoWriMo? Eh. It was just about a 50/50 split between yes and no. But, there was a really good discussion post. Basically, querying comes after lots of editing, not after lots of writing. 1) Sample size is crucial in surveys…and my sample size was pretty small, given the total number of agents out there. 2) One agent speculated that the uptick she saw might be related to people having time off of work, therefore giving them more time to query. Original post published on Old People Writing for Teens by GotYA contributor Holen Matthews. To view the original post and reader comments, please click here. Alexis has a lot on her mind. Her family is dysfunctional, her doll-obsessed sister is acting stranger by the day, and she’s crushing on a boy whose preppy-perfect exterior hides a wit and personality that might just be a match for her rebellious reputation. When her creepy heritage house develops a mind of its own and her sister starts playing host to a hundred plus year-old angry spirit, Alexis’s world goes from dysfunctional to dangerous. Bad Girl’s Don’t Die is the debut novel of Katie Alender. Katie was kind enough to answer a few of Kathleen’s questions about her book and how she’s getting word out about it. Katie, thanks so much for agreeing to be interviewed. Part of the appeal of Bad Girls Don’t Die was the strength of Alexis’s personality; she didn’t need the cute boy to save the day—in fact, she tried to keep the cute boy out of things for his own good. Did you think about whether or not Alexis would be a role model to teens when writing? Yes and no–I don’t believe that anything should come before story and character, so I never set out to make Alexis a role model. But yes, because I purposefully developed her to be the kind of girl she is–strong, independent, and not a damsel in distress. Mostly, I wanted her to be true to herself. I don’t think it’s in me as a writer to give readers an irredeemably helpless female character. That’s not what I care to put out in the world. Bad Girls Don’t Die seemed to be open and shut but there are two more books in the works. Did you originally conceive of it as the first in a series or was that something which evolved during the editing and publication process? I didn’t imagine the book as the first of a series, which is why the ending is so conclusive. I’m glad I had a real ending, because I prefer those in books (rather than cliffhangers that direct you to a sequel), but it definitely presented challenges when I was conceiving of Book 2. What’s interesting to me, as a writer, is that as I write Book 2, I find that Bad Girls Don’t Die did actually leave me some avenues to explore. In some ways the themes I’m dealing with now are more subtle, which is fitting, because Alexis is older. The trailer for your book is fantastic! How much did your film and production background help and did you always intend to use YouTube as a way of promoting the book? It helped quite a bit, as did the fact that production is our family business. Since the time that I became aware of book trailers, I wanted to do a good one for Bad Girls Don’t Die. I think trailers are most effective when they give readers a sense of the mood and tone of a book, rather than just rehashing the plot summary with a bunch of still photographs. So that’s what we set out to do. Having a film school background and a lot of friends willing to do us favors was a definite advantage in that regard! That being said, you don’t need a film degree and a bunch of industry friends to make an effective trailer. You just need to think about what you want the trailer to convey. The way I see it, I can go to a website and read the summary of the book faster than I can watch a trailer, so a trailer has to offer something more. Setting the summary to music and fading it in and out very slowly isn’t more–it’s just different. I didn’t plan specifically for Youtube; I just knew we’d want to get the trailer out and about. I do believe that it drives book sales. I think it will definitely grow, as video editing software continues to be available. As an author, I like them–who wouldn’t be flattered that someone dedicated so much time and attention to your book? I would just be on the lookout for a few things–(1) does it promote the book without spoilers? In other words, if someone watches your fanvid and thinks, “Well, now I don’t have to read the book!”, it’s kind of defeating the purpose. And (2), are you giving credit for the creative content you used? Music/photos/video you’ve included? I’ve had videos pulled from Youtube for the music content, and then I’ve been contacted by people who said, “I’d never heard of the song you used, but I went out and bought it after watching your video.” So I think pulling something off the internet “because it’s MINE!” is pretty dumb, provided the use doesn’t preclude people from actually buying something. But artists have a right to be credited for their work–AND the right to ask that it not be used, if that’s what they prefer. There’s a huge difference, in my opinion, in making a book trailer and, say, scanning a book and putting the whole thing online so people can download and read it for free. I love the approach you took with the review section of your website. Not only did you include review snips from the blogosphere but you also posted a response to each snip and linked back to the original blog. Did you always intend to engage bloggers and how big of a role has the blogosphere played in promoting Bad Girls Don’t Die? I’ve been making friends and connecting with people online for about ten years. Being part of the blogosphere is a natural extension of that. I never set out to engage bloggers as part of a scheme, but as they began to mention my book, the magic of Google Alerts allowed me to find them and say thank you or answer questions or react to reviews, etc. I feel very comfortable meeting and interacting with people that way, so it just kind of happened. It helps that most book bloggers are bright, funny, literate young women, and I have a tremendous appreciation for people like that. I believe that the sort of grass-roots online push for BGDD played a very big part in its success. I’m quite grateful to the book bloggers for their enthusiastic response. Katie, thank you for taking the time to talk with us. Bad Girls Don’t Die is available from Disney-Hyperion. For the latest news about Katie Alender as well as fun downloads and extras (including wallpapers and author commentary) visit her website at www.katiealender.com. Original interview published on Old People Writing for Teens by GotYA contributor Kathleen. To view the original post and reader comments, please click here. We all know that creative license means the alteration of reality or facts for the sake of a story. And while it’s easy to see why some writers take issue with changing past events in a historical novel, the lines get blurred when considering the fantasy genre. Take Stephenie Meyer, for example (yes, I just threw out the SM bomb). Even though her Twilight series is millions of readers own personal brand of heroine, some writers challenge her tweaking of vampire mythology. I mean, how dare her vamps not become human torches in the sun? Nor are they susceptible to garlic or other typical maladies of the dentally-challenged—sacrilege! But hold up, you say. Aren’t vampires themselves fictional creatures—well, at least according to those of us who don’t indulge in hallucinogenic drugs? So why on earth should SM—or any writer—be bound by rules for things that don’t even exist in the first place? I guess what it boils down to is this: creative license means different things to different people. What conclusions have I personally drawn? Simple. For me anyway, it all goes back to the basic tenet of fiction writing—making your lie feel true. So long as a book sells the fiction as fact, and does it well, then I don’t care what reality or expectations get altered in the process. I just need to believe. And yes, for all you Twilight haters—this includes sparkly vamps. But enough about me and my unhealthy, albeit drug-free, obsession with all things vampire. Where do you draw the line in terms of creative license in fiction writing? Original Post published on Old People Writing for Teens by GotYA contributor Debra Driza. To view original post and reader comments, please click here. College Student? Like to Write? Not an English Major? No Problem! I’ll be honest with you. I am an English major, but it wasn’t until my sophomore year did I decide on becoming one. For a while I was looking at going into Anthropology, and even Biotechnology at one point. However, I always knew that i loved to write and loved the idea of others acknowledging my work, so one semester I decided to sign up for Beginning Fiction Writing. It was a general education class, and anyone enrolled at the college was allowed to sign up. If you’ve never taken a workshop class, they are usually structured like this: everyone submits a short piece close to the beginning of the semester, and every class period one to three stories are workshopped. Students will marvel and cheer, give constructive criticism, debate grammar, etc, when going through everyone’s work. It’s like having 15-25 personal beta readers for a day–not to mention the four credits you get for writing and reading stories. Pretty sweet deal, huh? Well what if you don’t write short stories? What if novels are your thing? My advice to you is to start small. I have learned so much through having my short stories critiqued by other students and incorporated my knowledge into bigger works. What’s even better is that one of the short stories I have had critiqued in a workshop class ended up getting published, which made for a beautiful writing credit on my query letter! You DON’T have to be enrolled in a university to participate! I know a lot of OPWFT’s followers have jobs and kids. Some of you have graduated already, maybe even ten, twenty, or thirty years ago. But here’s the thing–a lot of community colleges offer creative writing workshops. I know that my city’s community college does. I even know of an adult school that offers classes, and most of them are at night. This way, those of you working a nine to five job can enroll. Don’t know how to start to even look for a writing class? Hop online and check out the website of your local community college or current university. If registration is nearing for next semester, you can usually find the schedules for classes. If you aren’t enrolled in college and can’t find the information online, try calling the college and setting up an appointment with a counselor. Nothing is more important to a writer than encouragement and constructive criticism. Take advantage of your local college and find a writing class that can fit into your schedule. You might love the experience, and decide that it is in your best interest to pursue an MFA! KRISTA’S LOOK AT QUERYING THROUGH THE MOVIES! Ah, the “Q” word—the word that strikes fear and loathing into unagented writers everywhere. The dreaded query. Books are written about how to write the perfect one, agents blog about the right and wrong way, and writers spend hours and shed blood and tears in places like Query Letter Hell over in Share Your Work on Absolutewrite. Well, this isn’t another “How To Post”….instead it’s a look at querying through some famous movie quotes. So cue the theme to Chariots of Fire as we take a stroll through film. Whatever your own personal beliefs are, you are going to have to cling to something to make it through the query game unscathed. Querying is not for the faint of heart, and it’s trying both emotionally and physically. You need a good support system of family and friends. Writing buddies are extremely helpful because of the old “been there, done that” adage. You’ve written your literary masterpiece—toiled long hours, edited, revised, and reworked. And you’re ready to send it out into the world of agents and publishers. It doesn’t matter if you’ve written the next Gone with the Wind or Harry Potter. If your query letter doesn’t shine, your book is never going to see the light of day. So, it is the hope of every query writer that they will build the perfect query letter that will interest a dream agent. You’ve just fired off ten to twenty of the query to end all queries. Now it’s time to sit back and field the massive requests. But then it happens. Your inbox represents tumbleweeds blowing in the wind. Yes, it is inevitable that some agents you query will be non-responders. So, no matter how many times you refresh your inbox, potentially giving yourself Carpel Tunnel Syndrome, it won’t matter. They will simply not reply. You must resign yourself to take a couple of deep breaths and step away from the computer. After several rejections, it’s tempting to throw up your hands and say, “As God Is My Witness, I’ll Never QUERY Again!” However, you can’t do that. You gotta persevere and keep on keeping it on! You’ll never land an agent without querying, and you’ll never land a publishing deal without an agent—unless you call go small publishing route. Sometimes after receiving a rejection, it’s tempting to fire off a not so “classy” response to the agent. You know a real acid filled rant about why your literary masterpiece SHOULD have been for them. But you gotta take the higher road and listen to Ron Burgundy. Yep, that’s right, STAY CLASSY! Cue, the music to Journey’s “Don’t Stop Believing”….Yes, you gotta keep believing that the words and ideas that you wove into your story are worthy, and they will mean something to more than just you. It starts when you get those first crits back from Beta readers, and you realize, “Hey, I might just be on to something here!” We all have those books, those movers and shakers, that changed our life. Yeah, I’ll admit that it’s tempting to get a little star struck when querying. From the uber-famous agents to the not so famous, we seem to forget that agents are people, too. Just remember that you are worthy and your work is worthy to query any agent out there! So go forth and query!!! And GOOD LUCK!!! One of the many things I’ve learned throughout the writing process is that you can never have too many words of encouragement. I want to impose ten tips writers should always remember. 1. Never, ever give up. I know. I know. You’ve heard this one hundred times by now, but it’s the truth. You can’t let rejections or editing get you down. Keep your chin up! 2. Read until your eyes burst into flames. Sounds crazy, but it helps. Not only does reading give you a break, but you can learn so much—how grammar, punctuation and writing styles are used. 3. Observe, and then observe some more. Yeah, that’s right. Take a seat somewhere the next time you’re out in public. Watch people. See how they react when speaking to someone else. What are their mannerisms? Oh, man. I can see those gears rotating in your head already. 4. Don’t edit as you go. Trust me—I know this is hard. Who cares if your first draft is crap? The odds of writing a perfect novel are probably 0.00000000001%. There isn’t a novel out there that’s perfect the first go-around. Wait until you’re finished. Give those fiery eyes a break. After a few days, you can go back and edit. 5. Write as much as your heart wishes. No, I’m not talking about just books. Keep a journal. Grab a pen and paper, step into your backyard and describe what you see. Think of it as practice. The more you practice something, the more experience you gain. 6. Learn from your mistakes. You’ve been pierced through your most vital organ and are bleeding abundantly. It hurts when someone takes the red pen of doom to your baby, doesn’t it? Don’t take it to heart (pun intended). 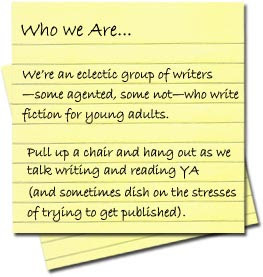 These people are your sidekicks, partner-in-crime, fellow writers. They want to help. Listen to them. Have an open mind. I promise your manuscript will be ten times better than the original draft. 7. Read out loud. You’re probably sitting there going, “Whaaaaaat? !” Yep, I said it. I bet you’re trying to remember the last time you read out loud right now. You can actually catch typos and sentence structures that are out of place better than if you read with your eyes only. Try it sometime. 8. Always keep a pen and paper handy. You never know when that shiny new idea will spring to life inside that head of yours. 9. Pay it forward. If another writer reviews your work, be kind enough to review theirs. 10. Stay true to your characters. They need you. They depend on you. You are the only way they’ll get their story read by hundreds—maybe even thousands/millions—of other people. Remember, they’re one of the reasons you began this journey. Interview with HATE LIST author, Jennifer Brown and Book Giveaway! OPWFT is excited to announce a contest to win HATE LIST with Jennifer Brown as the judge! All you have to do is leave a joke for Jennifer in the comments of this post, and the one that makes her laugh the hardest wins! You have until December 18th to post – good luck! *Winner’s outside of the US will recieve an Amazon gift card to purchase HATE LIST. Original interview published on Old People Writing for Teens by Jamie Blair. To view the original interview and comments, please click here. Are you ready for the most insane 30 days of your life? It’s that time of year…the time writers itch for all year. That’s right! National Novel Writing Month! At midnight Nov. 1st, writers from all over the world will open their laptops and tuck in to their pc’s to type the first of 50,000 words, the goal for the NaNo WriMo month. For those of you doing the math, that’s 1,666.6666666666666666666667 words per day. 50k is a good word count for a young adult or middle grade book, which is why it’s perfect for us OPWFTers. One of the best parts of NaNo is the supportive community. On the official website, http://www.nanowrimo.org/, there are forums and personal buddy lists to keep you motivated and provide hours of distraction from reaching your goal – so be careful!!! Don’t fall into the online trap and forget to write. Are you braving the NaNo challenge this year? Leave us your username in the comments so we can buddy you and we’ll all cheer each other on to 50k! I am not an agent. I do not have an agent. I did once talk to an agent on the phone. I babbled. My cousin happened to be with me at the time (we were having lunch) and, afterward, said I hadn’t looked that nervous since I decided to ask Brent C to the eighth grade formal dance. All of this is a roundabout way of telling you that I am completely unqualified to give query advice. That won’t, however, stop me from presenting you with my list of TOP TEN CARDINAL QUERY SINS (I figured it deserved capital letters). Start off with a rhetorical question. I’m not saying they can never work but enough agents hate them that you’re probably better off steering clear. Mention movie potential. Mentioning series potential is debatable (I think it’s fine for certain genres, others disagree) but mentioning movie potential is definitely the sign of an amateur. Concentrate on selling the agent on your book. Mention that another agent passed but said your character, plot, premise (insert item of choice) was great. You’d think this one would be common sense but, alas, not always. Use the words “fiction novel” (science fiction novel, however, is fine). I’ve read this in more than one query and it sets my teeth on edge. Tell the agent that this is your first book. Good agents are sharp (and , hopefully, you’re only querying good agents). When you don’t list your publishing credits, they’ll figure things out. Quote your characters. Don’t. Just don’t. Compare your novel to Twilight. Waste space on irrelevant details. You don’t have to tell the agent that you love to write or that you have a blog about kittens (unless your book is about cats). The goal of your query is to interest an agent enough to read your pages. Always ask yourself if the details you are including work towards that goal. Begin with “Dear Agent/Sir or Madame”. You spent year(s) working on your manuscript. For the love of 12 point Times New Roman, take a few seconds to properly address the query letter. And, for the love of Courier, don’t Cc other agents when you send it. One agent. One letter. One email. I leave up you, faithful commentators. What’s your cardinal query sin? These are only my opinion, and are in no specific order. Feel free to add to the list! Can’t wait to see what 2010 has in store. If you don’t have any of these books on your bookshelf, you need to go buy them now, now, now! Original post published by former OPWFT contributor Becca. To view the original post and reader comments, please click here. Fifth grade. La Paz Elementary School. I still remember sitting, wide-eyed with wonder, as our teacher read to us of a strange and mysterious world. Day after day, we all gathered eagerly on the floor, ready to become immersed in a land filled with tesseracts, characters with odd names like Aunt Beast and Mrs. Whatsit, and a young, rebellious high-school girl named Meg who ultimately saves the planet. Of course, I’m talking about the Newbury Award winning A Wrinkle in Time, written by Madeleine L’ Engle in 1962. This book was my first introduction to science fiction. After reading it in school, I remember snatching my older sister’s dog-eared copy from her room, so that I could log some serious mileage of my own on those pages. I mean, what’s not to like? A Wrinkle in Time features an amazing world chock full of equally amazing themes: love conquers all, the importance of personal responsibility, and fighting the pressure to conform. And as if that isn’t enough, the novel also hits on good vs. evil, courage, and integrating faith with reason. You’d think a book like this would be accepted and adored throughout our country, right? Wrong. A Wrinkle in Time, like so many other childhood favorites, made the 100 Most Challenged Books list of the 1990’s. Number 22, to be precise. What a sad, sad thing censorship is—I can’t imagine having to grow up without this classic science fiction fantasy to keep me company. Please, do yourself a favor—go to the American Library Association’s Most Frequently Banned Books page. Read the list, and then read the books. Have your children read the books. By doing so, you’ll help us fight conformity in our own world—and make Madeleine L’ Engle proud. Original post published by GotYa contributor Debra Driza. To view the original post and reader comments, please click here. The Giver is a 1993 novel by Lois Lowry. It is set in a future society which is at first presented as a utopian society and gradually appears more and more dystopian; therefore, it could be considered anti-utopian. The novel follows a boy named Jonas through the twelfth year of his life. The society has eliminated pain and strife by converting to “Sameness”, a plan which has also eradicated emotional depth from their lives. Jonas is selected to inherit the position of “Receiver of Memory,” the person who stores all the memories of the time before Sameness, in case they are ever needed to aid in decisions that others lack the experience to make. As Jonas receives the memories from the previous receiver—the “Giver”—he discovers how shallow his community’s life has become. Despite controversy and criticism that the book’s subject material is inappropriate for young children, The Giver won the 1994 Newbery Medal and has sold more than 5.3 million copies. In Australia, the United States and Canada, it is a part of many middle school reading lists, but it is also on many banned book lists. The novel forms a loose trilogy with Gathering Blue (2000) and Messenger (2004), two other books set in the same future era. My friend, who happens to be a high school English teacher, and I were at Borders one Friday night perusing the YA section, because that’s what us old thirty-somethings do on Friday nights. Her hand darted out and grabbed a thin book with an old, grisly looking man on the cover. She shoved it into my hands and said, “You have to read this!” The book was The Giver by Lois Lowry. I bought it, but I’ll admit I was hesitant to crack the cover. It didn’t look like “my thing”. After about a month of collecting dust on my nightstand, I picked it up one night after scooting in bed under the covers. It was a different read for me. There were no desperately in love teen girls, no vampires or werewolves, no alcoholic mother or abusive father, just seemingly perfect people living in a seemingly perfect world. Then the metaphorical shade was drawn and Lois Lowry gave us a peek into the real world she’d created, where babies and old people are “released”, a civil form of euthanasia in Lowry’s dystopian society. As I read, and was unable to stop reading, I recalled Brave New World from my high school days, a book I devoured and recommended to everyone in my family. After reading the last page of The Giver, I immediately opened a new Word document and began my own dystopian novel. As for being banned…I’d rather have my children learn about a dystopian society, and the level of control a government can have over people from books like The Giver, than by first hand experience. Hopefully it will open their eyes and political interests early. Not only do authors like Lowry spark a love of reading, they spark thoughts about morality, responsibility, and political sensibility.